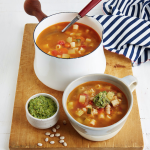 Think of this soup as a French take on minestrone, with a punch of pure pesto stirred in. Serve it with a baguette and a glass of vin and transport yourself to Provence and those lovely lavender fields. Heat a large saucepan over medium-low heat. Add oil, onion, and garlic. Sauté for 3 to 5 minutes, or until softened. Add zucchini, carrot, tomato, beans, sea salt, and pepper. Cook for 2 more minutes. Add broth, pasta, wine, and bay leaves. Stir to incorporate and cover. Cook for 20 to 25 minutes, or until pasta and vegetables are soft. Add garlic, spinach, basil, walnuts, oil, lemon juice, miso, sea salt, and pepper to a food processor or high-powered blender. Blend for 15 to 30 seconds, or until smooth. Discard bay leaves before serving. 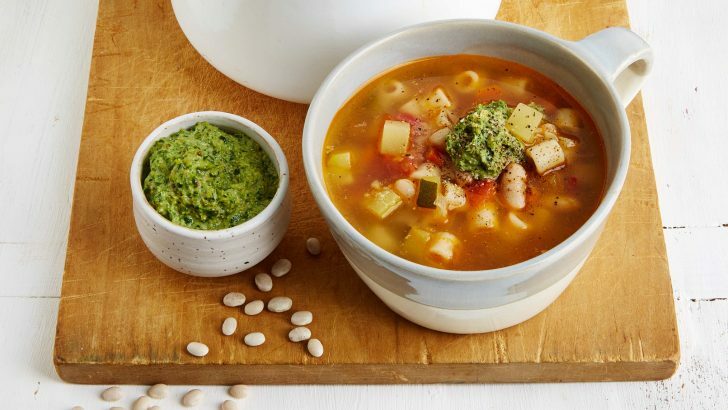 Ladle warm soup into bowls and top with a generous dollop of pistou, and Parmesan, if desired. Marsala wine from Sicily is great for cooking because it won’t break the bank. However, if you have an open bottle of red wine, just pop in 2 tablespoons in place of the Marsala and your soup will be equally delicious. Los Angeles-based Spork Foods is a gourmet vegan food company owned and operated by sisters Heather Bell and Jenny Engel. They offer vegan organic cooking classes, chef trainings, recipe development and private chef work in Los Angeles and worldwide. Their cookbook, Spork-Fed, is currently in stores, with a foreword by fellow fans, actors and sisters, Emily and Zooey Deschanel. Their second cookbook, Vegan 101 just launched and can be found online and in bookstores. We had the honor of asking Jenny and Heather a few questions (below) and we’re excited to share their incredible French Pistou Soup recipe from the new Vegan 101 cookbook! WOV: Heather and Jenny, I love the book and your easy, fun approach! How did the two of you start cooking vegan? We began cooking vegan food when we decided to make the leap to a vegan lifestyle while in college, about 17 years ago! At the time there weren’t as many delicious non-dairy alternatives like vegan cheeses and meat analogs out there so becoming comfortable in the kitchen was a must. There was no way we wanted to give up the flavors and textures we once enjoyed just because we wanted to choose a cruelty-free way of living. WOV: I encounter so many people who think vegan food is going to be difficult and are surprised when they learn how easy it actually can be. What are some of your favorite ways to show how easy vegan cooking can be? Vegan cooking is all about the spices, vinegars, and seasonings you can creatively use—and fresh ingredients of course! If you make the effort to stock your pantry, then you’ll be halfway to making a wide variety of delicious meals in no time. Also, cooking vegan can be a time saver compared to preparing meat-based dishes because you don’t have to marinate anything overnight, or spend time cooking your food to eliminate bacteria. WOV: Your recipes appeal to people across the spectrum of novices to culinary experts. Given that we’re approaching the holiday season, what are some of your top picks for desserts? Thanks so much! We feel like having a delicious dessert is the best window into opening up peoples’ minds about veganism. When you cap your meal with something memorable, you can’t really leave feeling unsatisfied. One fun recipe from our book, Vegan 101, that we’d recommend for the Holidays are our Pistachio Cranberry Popcorn Balls. They’re so fast to put together, easy for kids to participate in, and the colors are perfect for the Holidays too. They’re also easy to transport! Another treat that may take a little more time to prepare, but will wow any crowd, is our Blueberry Buckle. It’s our spin on an old-fashioned blueberry coffee cake. WOV: What’s the piece of kitchen equipment you can’t live without? Though many of our cooking tools are important to us, and are used regularly, our Vitamix blender is one of our favorite items. Unlike other blenders, it really makes anything from a smoothie to cashew cheese taste like the best version of itself. But if you want to keep it basic, just a high-quality, sharp chef’s knife will make cooking a pleasure. Thank you so much Jenny and Heather!